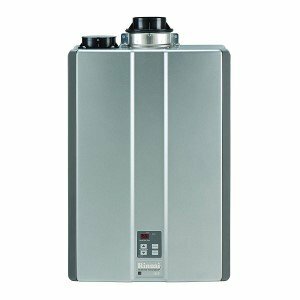 A review of Rinnai RUC98 tankless water heaters for residential water heating including the main characteristics and exclusive features for easier selection. Check out how flexible venting system allows fast and hassle-free installation of the indoor models and how high energy factor brings excellent savings to its owners. Rinnai RUC98i tankless water heaters are the largest models from the RUC group that come with the power ranging from 15,200 BTU to high 199,000 BTU, thanks to the powerful and modulating gas burner. The built-in gas burner is not only strong but is eco-friendly, due to its low NOx gas combustion. Water can be heated up to 140 F in residential applications and 180 F in commercial, and supplied from as low as 0.4 GPM to the maximum of 9.8 GPM, easily supplying hot water to homes with 3 to 6 showers or fixtures. Rinnai RUC98i models are coming from the Ultra SE+ series, a series with the water heaters that utilize tankless and condensing technology, heating and delivering hot water on demand and in an endless supply. Thanks to the condensing design and two built-in heat exchangers, the efficiency is higher than the efficiency found on non-condensing models with one heat exchanger, and the exhaust temperature is lower, allowing a wider selection of the vents, including PVC. Great flexibility in the venting system for Rinnai RUC98i heaters allows usage of the PVC, PP and CPVC pipes with the concentric and twin-pipe venting, which eliminates the need for the venting kit or adapters. Such an innovative direct vent design with the smaller and compact size is what makes installation faster while providing more options. Due to its high hot water flow rate of up to 9.8 GPM, Rinnai RUC98i can deliver an endless supply of hot water up to six bathrooms at the same time and thanks to the modulating gas valve your comfort and set temperature are not disturbed. There will be much less annoying temperature fluctuation or commonly known as "cold water sandwiches" and with the built-in electronics, the temperature of hot water at the fixture is stable and accurate. With the built-in Circ-Logic recirculation, Rinnai tankless water heaters can control the external circulation pump and deliver hot water as soon as there is demand, shortening delivery time while reducing the hot loss. You can even set the recirculation pattern to your liking, which ensures better comfort. As can be seen in the picture, the temperature controller is built into the front panel of the indoor models, while it is provided with the outdoor models. The control allows simple temperature setup, monitoring and easy troubleshooting with the error code display. For the commercial and hydronic applications that require higher temperatures and which cannot be achieved with the provided controller, a different type is available. Part of the advanced features is an enhance scale detection system that helps in reducing the scale build-up inside the unit, resulting in consistently high efficient heating while protecting the unit from damages and premature failure. The Control-R 2.0 wireless module and mobile app make the control easier offering timers and schedules, so even when away you can remotely manage the heating operation. Also, what is also important, you will have a piece of mind as the Rinnai dealer can assist you in remote diagnostics, which will shorten repair time if the problem occurs. The voice control system brings these advanced tankless heaters to a new level, so the units can be activated using the Amazon Alexa integrated technology. The RUC98i model has a modern metallic look which makes them ideal for the indoor installations due to the attractive look, and outside due to the long-lasting casing. The warranty is long 12 years on the heat exchanger and 5 on other parts. High efficiency of up to 0.96 and Energy Star compliance. Maximum of 12-year limited warranty on the heat exchanger for residential water heating, 10 years for water and space heating and 5 years for commercial applications. Ultra low-NOx emission which meets strict rules in some states. Remote monitor and control using smart devices and built-in features. Fully recyclable so there will be less waste on the landfills. Maximum vent length up to 65 feet concentric type and up to 100 feet for 4" twin pipe PVC/CPVC. Gas line 3/4" and 1/2" gas line compatible. Hot water flow: 0.26 - 9.8 GPM maximum. Temperature: 98 F - 140 F (185 F). Dimensions: 18.5" x 26" x 10". What if you don’t need such a powerful water heater? For homeowners who prefer something smaller, with less power and water flow, but more affordable, and would like to have the same features as found on the RUC98i, Rinnai offers two more sizes; RUC90 and RUC80. Rinnai RUC90i heaters are the mid-size models that have the gas input of 180,000 BTU and water flow rate of up to 9.0 GPM and can provide sufficient amount of hot water to homes with 3 to 5 fixtures operating simultaneously while keeping the comfort level high. Rinnai RUC80i models are models with the lowest capacity, designed with the same features as the RUC98i or RUC90i, including the ultra-high efficiency of 0.96, but not as strong, offering lower power of 152,000 BTU and water flow rate that can reach up to 6.0 GPM, making them a preferred choice for homes with 2 to 4 fixtures working at the same time. Rinnai RUC water heaters are maybe not the best from this manufacturer, but the condensing and tankless technology, Energy Star certification, advanced scale detection, voice activation, recirculation system, and decent price range, are good enough reasons why should you consider one of the models.